I swung by Plot #59 this afternoon on the way back from a volunteering session for Incredible Edibles Prestwich, raking over the new raised beds in the polytunnels, to get the third of my second early potato trenches dug while the weather was good enough for digging. Strolling up the middle of the plot, I noticed that the fruit section is showing some welcome signs of life (click for a bigger pic). 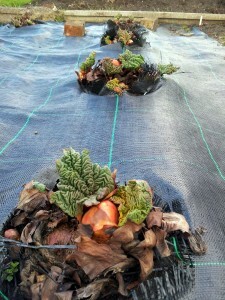 At long last, our rhubarb crowns rhumble into life. 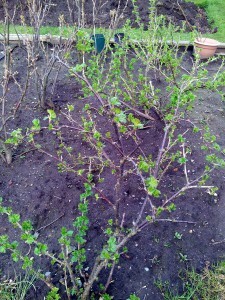 Good to see the gooseberries and raspberries bursting into leaf there. 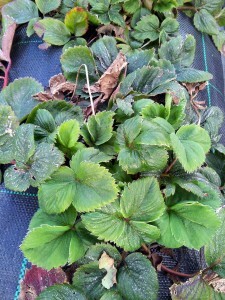 The strawberries are putting on a lot of new foliage as well (note to self: they need a good prune to cut out the old, dead leaves and make room for the fresh ones). And although we must have the latest of late varieties of rhubarb – honestly, some folks on Twitter are eating crumble already! 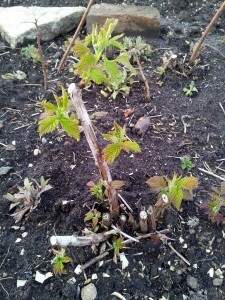 – they’re finally showing signs of Spring growth as well. Mind you, the crowns might be a bit laid back, but once they get going they’re usually unstoppable right through to Autumn, so I’m not complaining. How’s about your plot? What’s coming along nicely and what are you still waiting for?